The most startling thing about this episode was Amanda Waller showing up at the head of an ARGUS special ops team, kidnapping Diggle, telling him that she needs him and Oliver to break an agent out of a prison in Russia and that she knows, consequently, full well what he and Oliver get up to each evening. It reminded me of this one episode of Justice League Unlimited in which Waller pretty much tells Batman that she knows he really is Bruce Wayne and it forms a really good subplot later on in the show. This opens up all sorts of opportunities for Oliver to “work” with ARGUS and Waller, something I would really enjoy. It should also be noted that Amanda Waller’s last live-action appearances include the Green Lantern movie and the Smallville show. Each appearance has presented a different Waller, and Arrow: Keeping Your Enemies Closer is no different. And I have to say that Cynthia Addai-Robinson’s Waller is quite close to how she appears in the New 52 comics, across a variety of titles. Of course, once you introduce Amanda Waller and ARGUS, you also have to include the Suicide Squad in one way or another, which was one of the best things about the later episodes of Smallville. Might Arrow do the same? I don’t know, but I’ll definitely love to see that! This episode also ends up tying into season one in another way: Ollie’s Russian connections. While he was aboard the Amazo, held hostage essentially and tortured (yet again), he eventually saved the life of a man high up in the Russian mafia, a man named Anatoli. His name came up a couple times in the first season, when Ollie made contact with the Starling branch of the organisation, and this time, we can finally put a face to the name. David Nykl is the man tasked with presenting this character in the show and I think he had some interesting moments. There’s obviously some history between them that occurred on the Amazo and I’m looking forward to seeing how it all plays out. The great thing about this episode wasn’t just that we got to see Ollie operate in a different environment than Starling, and that we had Amanda Waller and her ARGUS goons show up, but also that Summer Glau’s character Isabel Rochev once more became prominent. She’s kind of flown under the radar thus far, appearing here and there, but this episode marks her most significant screen time yet. She really takes Ollie to the task for failing in his duties as the head of Queen Consolidated and when he decides to make a supposedly impromptu trip to Russia to check on the company’s assets there (more that he is going there to help break Diggle’s friend Lyla out of prison there), she shows up and co-opts his trip. Since she is now a joint CEO of sorts for the company, she is keeping an eye on Ollie and also trying to head off some potential controversies since there’s a rumour floating around that Ollie and Felicity are in a relationship, a typical corporate romance. It forms a really hilarious subplot in the episode since Ollie rightly denies anything of the sort, but Isabel doesn’t really believe him, and she’s kind of in the right too since she has no knowledge of the professional relationship that Ollie and Felicity are in. And, inevitably, there’s some one-off romance between Isabel and Ollie, which I thought was really odd. It seemed forced and out of place, not something I was really expecting. Sure, Ollie’s private life is pretty much shot right now, so I suppose the show’s writers are trying to balance that off with a one-night stand, but I think its the wrong approach. No matter what the reason, it just becomes a cliche, that the majority of the women in Ollie’s various lives end up sleeping with him. Its a very typical cliche too, like the starship captain who always gets the girl, if you catch the drift. And we have some possible romance between Felicity and Ollie, but that seemed quite platonic, which was fine with me. The relationship between these two has evolved significantly and they are close friends now, and there is a clear setup between them, but I don’t want to see this whole thing devolve into another romance for Ollie either. It takes away from the seriousness of his kinda-sorta lone wolf approach and it just ends up being a cop-out. But, thankfully, all that is a minor thing in this episode. The focus is on Diggle’s revenge for his brother’s death and we get to see some great scenes between him and Deadshot, as well as that tough call he has to make since Lyla’s life is on the line. I loved the focus on Diggle since he is one of my favourite characters on the show and this entire subplot has been a long time in development already. While its not resolved, we do get some revelations about his brother’s death, and I really liked that angle. It muddies things up quite nicely and presents another angle of approach for the trio to investigate once they get back to Starling. I love how the show continues to give us some revelations and then offer up some new mysteries too, so that there is a clear progression of the overall narrative as well. There are, honestly, an absolute ton of things happening in this season and the show is balancing them all with a sort of revolving door policy. Characters like Isabel and Brother Blood suffer a little with this, but I like that they are being slowly built up, still keeping up with their mystique. It may interest some people to know that since the majority of the focus is on the trio in Russia, we don’t really see much of Starling. Roy Harper and Thea Queen’s relationship gets some minor development, and involves Moira Queen’s upcoming court appearance and how she needs to be presented as a loving mother and someone who taught her kids to respect and obey the law. This naturally means that the relationship suffers, but we see a nice little resolution to that as well. Slightly cheesy, but good all the same. And there is no Officer Lance or Laurel in this episode. I missed the former, but not the latter. Laurel needs a clear vision since her character is just too confusing right now, flip-flopping between things too much, and she needs a rest, so I’m glad that she sat this one out. And finally, there are the scenes on the Island, or rather, we should say the scenes on the ship. More revelations on that front, involving the corpses from World War 2 that Slade, Shado and Ollie found a few episodes, and this all ties in further to Professor Ivo’s presence on the show. And we get a confirmation that Slade and Shado are alive! That was a great moment, but entirely too brief and short-lived. The show is maintaining a high consistency in quality and I’m definitely enjoying the ride. For me, right now, this is definitely the best show on TV, and its only going to get better once we get to the Flash episodes and see Barry Allen transform into the scarlet speedster. 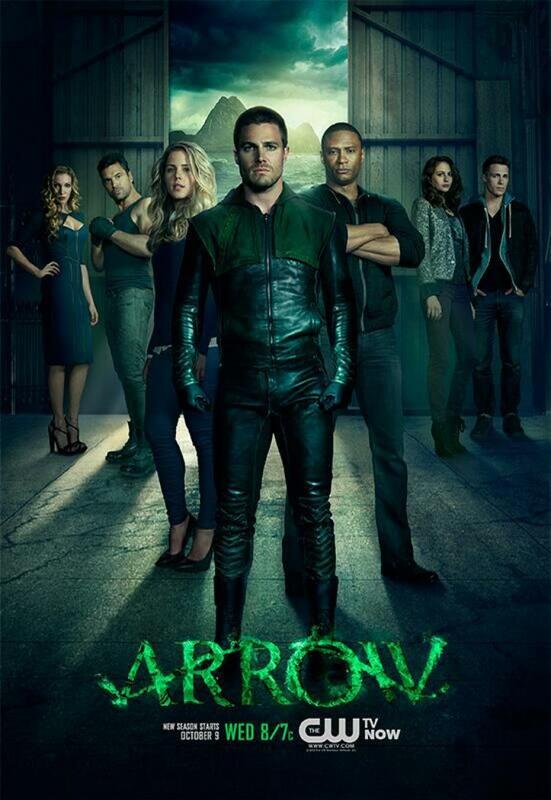 More Arrow: S2E01, S2E02, S2E03, S2E04, S2E05. Posted on November 16, 2013, in Arrow, Review Central, TV Show Reviews and tagged AMAZO, Arrow, Black Canary, CW, David Ramsey, DC Comics, Deathstroke, Dollmaker, Emily Bett Rickards, Felicity Smoak, Green Arrow, John Diggle, Manu Bennett, Oliver Queen, Professor Ivo, Review Central, Slade Wilson, Starling City, Stephen Amell, Superheroes, Supervillains, TV Show, TV Show Review. Bookmark the permalink. 3 Comments.